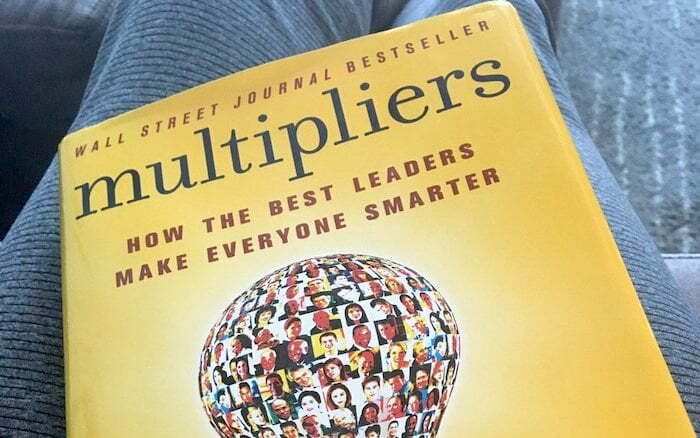 Multipliers is a book about management styles. It describes two types of managers: Multipliers are good ones that grows people, hence multiplying the talent at the company; Diminishers have various defects which shut down and stagnate their people. Talent Magnet: attracts talent and grows people. Looking for talent everywhere, finding their native genius; utilizing them to the fullest by removing blockers. Challenger: defines opportunities to challenge people. Drives collective intent toward the same opportunity. Debate Maker: access wide spectrum of thinking, encouraging rigorous debate. Frames issue, sparks debate, and drives decisions. Investor: maintains 51% of the vote and 100% of the responsibility for the result. Empire Builder: hoards resources. Acquires resources, puts people in boxes, and lets talent anguish. Tyrant: creates a tense environment. Dominates space, interrupts others and criticizes. Know-It-All: gives directives to showcase knowledge. People vie for attention from boss and wait until told what to do. Micro Manager: believes people can’t figure it out on their own. Maintains ownership. It’s somewhat a stereotypical corporate management book discussing what makes a good boss versus a bad one. I wonder of what is the practicality of it all? A bad boss won’t read the book, and even if they did, they wouldn’t follow any advice. A good boss already knows what to do. Yes, they perhaps might pick up a tip or two, but the whole section on what a bad boss is, is somewhat pointless. People who are not managers and maybe want to be managers? It’s an academic resource about what is a good vs bad manager. These people should better understand the politics of it all, how to network and how to identify the type of people to network with. In the end, it’s more likely justs generates drama as readers tag managers they know. Tony is a Empire Builder, Alex is Micro Manager, etc. I get some people will praise the book for all its technical analysis, but I think most of the information is intuitive to anyone who wants to be a manager. They already have had experience working with both good and bad managers. I wouldn’t recommend spending the time to read it.